When it comes to choosing running shoes for plantar fasciitis and heel spurs, arch support is critical. Plantar fasciitis can make even walking a painful experience. But if you're an avid runner, the idea of staying off your feet may seem even more painful than the discomfort in your heel. Luckily, you don't need to let this condition stop you from the sports you love. Once you're on the path toward healing, the right running shoes for plantar fasciitis and heel spurs will prevent a recurrent injury and keep you more comfortable on your runs. Ready to pick out your next pair of running shoes? Make sure to consider the following factors to ensure that you make the right choice. If you've never picked running shoes – or are just buying your first pair since being diagnosed with plantar fasciitis – the process may seem a bit overwhelming. With so many styles and brands to choose from, where do you begin? First, pick out a shoe that's specifically designed for running. 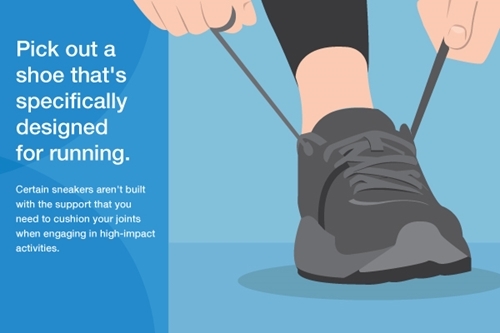 Other sneakers aren't built with the support that you need to cushion your joints when engaging in high-impact activities. Next, think about what type of running you do. There are three major categories from which to choose: trail, road or track. Trail: Do you love running outside on dirt paths? Trail shoes are specifically designed to deal with rocks, mud and other elements of nature you may encounter when you take your runs off-road. Road: If you're more of a city girl, road shoes may be the way to go. These options are made for use on pavement and similar hard surfaces. Track: When it comes to competing, you'll want to look at track shoes. However, if you're a casual runner, you likely don't need to worry about this type. If you log a large number of miles each week and run on various surfaces, you may even consider more than one type so you have the right shoe for every run. The right shoes are important if you have plantar fasciitis. When it comes to choosing running shoes for plantar fasciitis and heel spurs, arch support is critical. Without proper support, your plantar fasciitis may recur. Supportive: Of the three types of shoes, supportive – as the name suggests – is the most structured, providing maximum support. Neutral: Neutral shoes provide some support, but they are not as structured as supportive shoes. They are also lighter, due largely to the fact that they have less cushioning. Minimalist: As the name suggests, minimalist shoes are extremely lightweight and provide little support. Though supportive is often a good choice if you have plantar fasciitis, a lot depends on the shape of your foot. To make sure that you find the right shoe, consider visiting a store that specializes in running equipment. You should also always consult with your physician before returning to running after being diagnosed with plantar fasciitis. For extra support, check out the Brownmed SoftStride™ foot orthotics line.